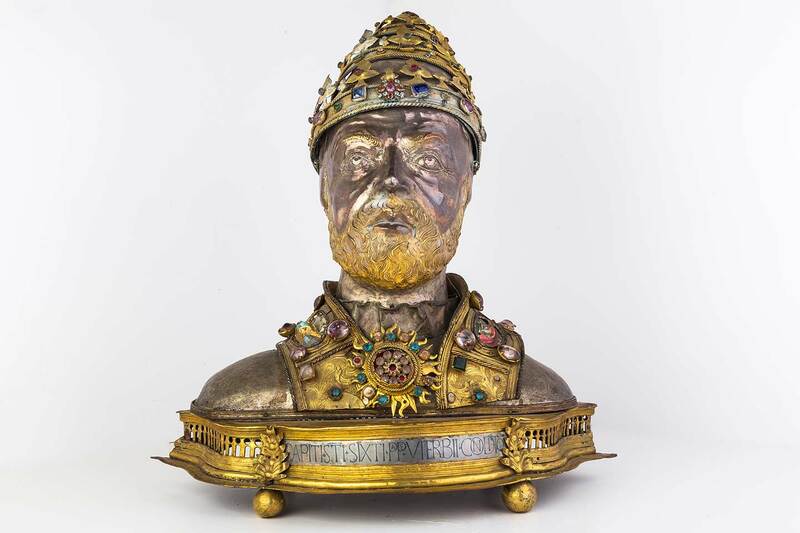 Bust of San Sisto II – the reliquary of San Sisto II (became pope in 257, martyrized in 258 during the reign of Valeriano) from the Church of San Sisto, has a gilded metal base with round feet, rich embossed decorations on the vestments, on the star and on the tiara. It is further enriched by the sprinkled semi precious stones and the phrase Capitis s.tî Sixti pape Viterbii condito. The work was mentioned by Niccolò della Tuccia’s description of a procession organized by Monsignor Pietro di Francesco, Bishop of Viterbo and Toscanella (Tuscania) on September 20, 1467. It was carried in a procession in honor of the Madonna della Quercia in “ a wooden tabernacle carried by 4 priests“. Thanks to this information we are better able to date the work. It has often been compared to the bust of Santa Margherita kept in Montefiascone but the Senese inspiration of this latter bust contrasts with the realism shown in that of the martyred pope’s bust. More similar is the bust of San Vivenzio in Blera, by the Viterbese artist Bartolomeo di Russolino.